Chris Thompson didn’t read the script. 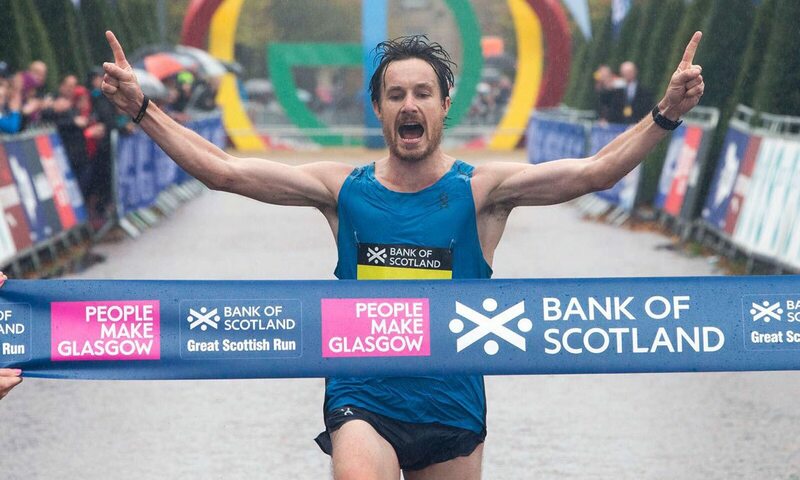 The home crowd had arrived in anticipation of cheering local boy Callum Hawkins to a second consecutive win at the Bank of Scotland Great Scottish Run half-marathon in Glasgow but instead it was the Englishman who produced a storming run to finish first. Some of the watching public attempted to have a bit of fun with the British half-marathon champion and former European 10,000m silver medallist, not being entirely truthful about the size of his lead at certain junctures, but Thompson’s big move in the first half of the race proved decisive and he crossed the line in the rain first in a time of 62:44, convincingly ahead of a sprint finish between Hawkins and Tsegai Tewelde, who both clocked 63:18. From the gun it had been a combination of Hawkins, Tewelde and Thompson at the head of affairs, with the senior member of that trio leading them through 5km in 14:46. It was a fifth mile of 4:36 that really stretched the gap he held at the front and, though there were more than a couple of glances over his shoulder and a slip which almost sent him tumbling to the ground, it was to be the Aldershot, Farnham and District man’s day. Hawkins, who admitted to having a wobble in the early stages after a fast start, gathered himself and did his best to come back but the effects of finishing fourth in the IAAF World Champions marathon are still being felt, as is the rust brought on by his wise decision to take a complete break from running in the immediate aftermath of London. Andrew Butchart’s half-marathon debut had been the source of some intrigue, but it was clear from the early stages that he would not be keeping pace with the leaders. He very evidently loved running in front of the home crowd, however, interacting all the way as he finished 14th in 70:03. It was Thompson, however, who was deserving of most attention on this occasion after his front-running display. “There were a few people being honest and a few being cheeky,” he said of the crowd noises he was hearing out on the course. “Once I’d got a gap, your mind is playing tricks. This is a hard way to beat Callum because he’s usually doing this to other athletes. Someone said ‘ten metres’. I said ‘don’t look’. But then I did and realised it was more than ten metres and I relaxed. In the women’s race, Commonwealth marathon champion Flomena Daniel was utterly dominant. Despite the very unKenyan conditions, the woman who took gold in Glasgow three years ago clearly loves running in the Scottish city and won in a time of 70:17, with Aldershot’s Charlotte Purdue second in 72:18 and Fionnuala Ross of Shettleston third in 74:26. Jo Pavey, who has not had her injury troubles to seek this year, was seventh in 78:11. Purdue, who was first European in the world championships marathon, was happy with her peformance at the beginning of another training cycle which will target the European Championships next summer. In the 10km races there was a win for Ronhill Cambuslang’s Stuart Gibson in 31:37, ahead of Shettleston’s Alasdair McLeod (31:55) and Darren Thom of New Marske Harriers, who clocked 32:55. Bedford’s Rebecca Murray continued her successful return from injury by winning the women’s event in 34:30, followed by Jenny Bannerman of Inverness in 35:50 and Metro Aberdeen Claire Bruce (35:55). There was an elite wheelchair event over the 10km distance too, with Sammi Kinghorn preparing for her marathon debut in Chicago next weekend with a time of 29:45, finishing behind men’s winner Sean Frame (29:28), with Simplyhealth Great North Run winner Simon Lawson third overall in 31:36.